Between June 13 and 26, the Silver Valley (Idaho) Fuller Center hosted an RV build for a special rehab project in the city of Mullan. Ten RV Builders joined youth crews from a nearby Lutheran camp to restore an old home for the Pelham family of three. Several years ago, when Silver Valley was working under a different housing organization, it received a home from the Shoshone County commissioners. The house had been given to the county but was unsold, most likely because it was in terrible condition. A section of the house was sitting on dirt and as a result, had begun to rot. The roof was in disrepair and all of the electrical wiring was unusable or unsafe. Dirt had to be removed by hand before new supports could be installed. When Amethyst Pelham chose the house for her own, it became Silver Valley’s focus for the RV build. For two weeks, youths and retired persons worked together to repair floors and walls, replace drywall and ceilings, patch the roof, texture, paint and insulate. The three-bedroom home also got new cabinets, siding and electrical wiring. The group in Silver Valley has hosted Habitat for Humanity Care-A-Vanners for many years and was delighted to host RV Builders for The Fuller Center. 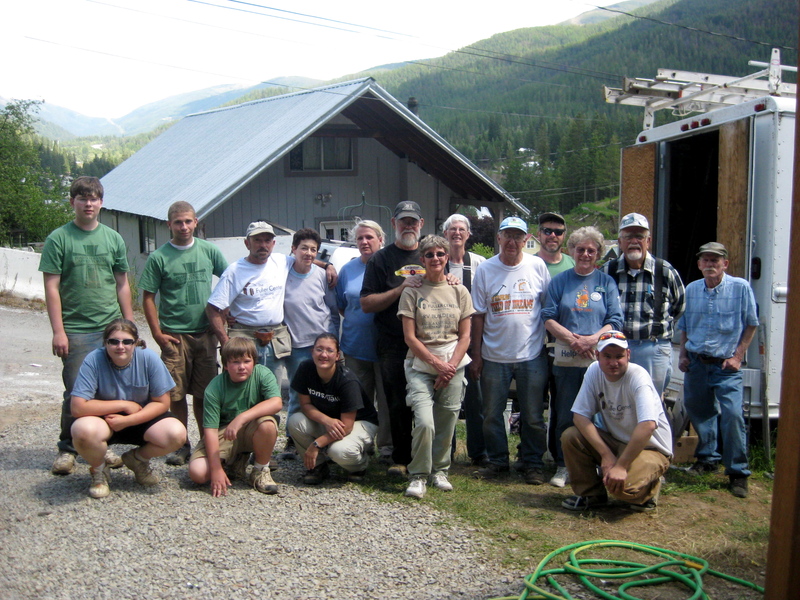 It was the first rehab worked on by motor home volunteers in Idaho. Judy Blalack of Silver Valley Fuller Center loves to have them and described them as dedicated and eager to learn new things. "Many have become extremely efficient carpenters, electricians and installers of siding," said Blalack. "We look forward to having these congenial helpers every year. In fact, we add RVers to our newsletter list and are still receiving donations from some of the first volunteers we hosted in 1994!" At the end of the project, the covenant partner held a pig roast to thank the RV Builders and introduce them to members of the community they helped serve. 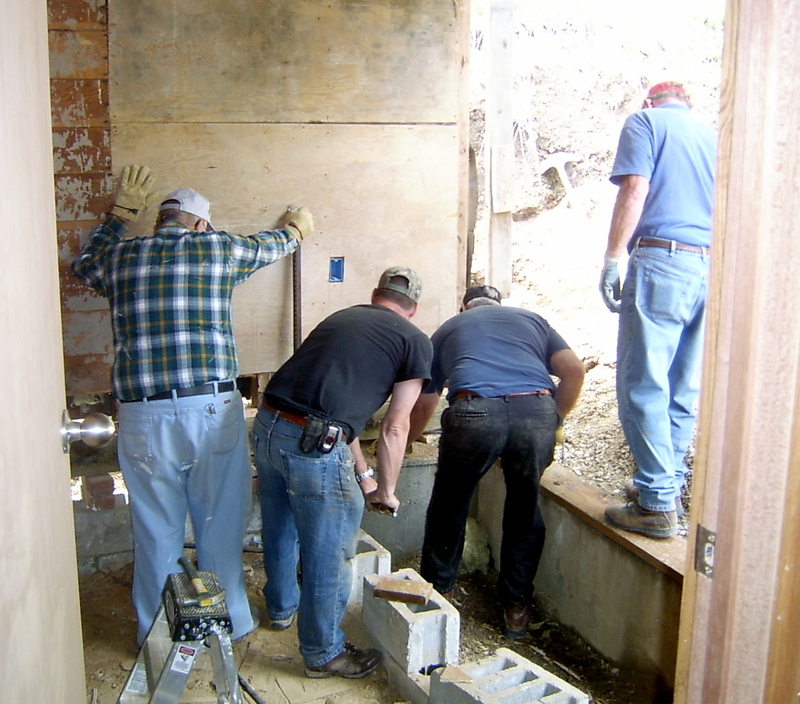 The house will be completed and dedicated by the end of summer with the help of local volunteers. Learn more about the Silver Valley Fuller Center. See our current RV Builders host sites and volunteers opportunities. Meet the Usserys, two RV volunteers who attended the build.